Amongst the many thousands of photographs from the National Library of Scotland to be found on Scran, there is a collection called Images of War. These were taken by official War Office photographers during World War One and form part of the Haig Papers. This astounding and often arresting war photography contains a small set of 21 images, which tells the story of the South African Native Labour Corps, referred to as the SANLC. 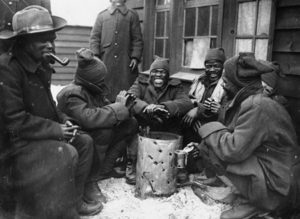 Some 20,000 South Africans worked in the SANLC and took part in World War One, however due to South Africa’s segregationist policy, black South Africans were restricted to non-combatant roles. 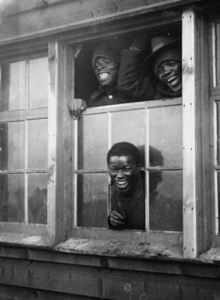 The SANLC were discriminated against because of the racist attitudes of the period which meant that black South Africans were not enlisted as combat troops, but only in the Labour Corps. They laboured in the docks, in salvage, supply, burial and other non-military jobs. They were used as cheap manual labour but were denied the right to serve in the army or to be given any recognition of the role they played. In part this was due to the South African government’s fear of the native claims for land. When the SANLC were recruited, the units tended to be organised on the basis of their homeland tribe or region. 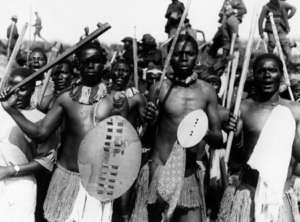 In part this was to avoid problems from traditional tribal feuds, but it also reflects the fear of the South African government that the different native groups would combine against the existing white rule. Although the SANLC were not meant to be deployed in combat zones, there were inevitable deaths when the docks or transport lines on which they worked were bombed. The greatest tragedy was the sinking of the troopship SS Mendi on 21 February 1917, when 617 members of the SANLC were drowned in the English Channel. The SANLC had operated in the fight against the Germans in South West Africa since September 1916, but the Labour Corps for the Western Front was established and camps set up in 1917. 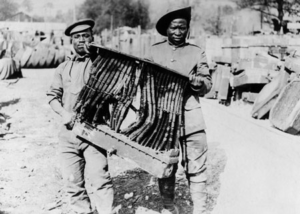 The various Labour Corps included many non-European groups such as the South Africans (SANLC), Egyptians, Chinese, Cape Coloured and Indian Corps. They were not only restricted from contact with white Europeans but were also segregated into different racially-determined Corps. Unlike some of the other labour contingents, the SANLC were not awarded any medals after the war. World War One saw the development of a system of ‘official’ reporting by professionals especially recruited into the forces. Several of the SANLC series of photographs have been attributed to photographers John Warwick Brooke and Ernest Brooks. Initially reluctant to allow cameras near the fighting, it took some time for authorities to appreciate the propaganda and recording potential of photography. The cheerful appearance of the SANLC men is possibly deliberate propaganda on the part of the photographer, to counterbalance the reports of strikes and unrest among the various nationalities of Labour Corps, when they felt their conditions were unreasonable, or their original contracts had been broken. These photographs provide us with an invaluable record of how the Government and Military wanted the war perceived.